According to sources, Carmelo Anthony is leaning towards leaving the Knicks in free agency this summer, and the Chicago Bulls and Houston Rockets have emerged as the frontrunners to land the star forward. Melo is reportedly unconfident in the Knicks’ ability to build a winning team this season, and is unwilling to wait until next year, when the Knicks will have a large amount of cap space (and a draft pick). He was also reportedly unhappy with Knicks President Phil Jackson’s public comments in which he expressed hope that Anthony would take a less-than-maximum contract to sign with the Knicks… even though Anthony would have to do that to sign anywhere else. Yahoo Sports’ Adrian Wojnarowski was the first to report the rumors. The Bulls and Rockets are both well over the cap, but have ways to clear enough room to get Carmelo. Because both teams will likely need to make some trades to make Melo fit under their budget, the Knicks could get decent compensation from any team that signs Carmelo. Jimmy Butler, Carlos Boozer, Taj Gibson, Jeremy Lin, Omer Asik, Chandler Parsons, and draft picks could all be in play. 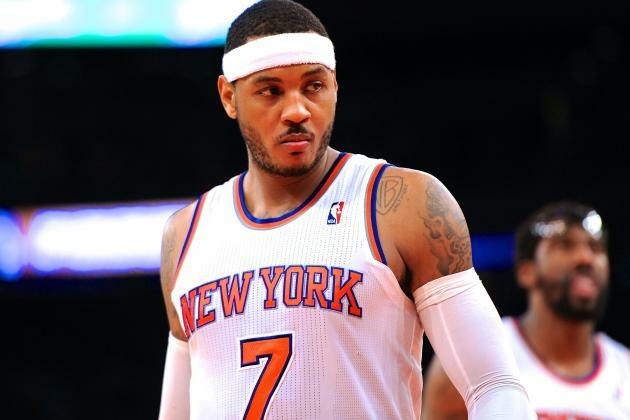 Carmelo doesn’t seem like he’s going to stay in New York just for the max contract, if the Knicks even offer him one. However, he would have a much better roster around him in New York today if he hadn’t forced a mid-season trade to the Knicks a few years ago instead of signing with them outright in the summer. Carmelo did this because he was worried signing as a free agent would cost him a ton of money, but it only ended up costing him about $4 million. Now, according to these reports he’s perfectly willing to give up $30 million (and his public image) to bolt for a new city, because he wants to win. Go figure. These are just reports. Carmelo hasn’t opted out of his contract yet, which he will probably do by June 23rd, and he hasn’t signed with another team. The Knicks should still be in the ballgame, but according to Woj and his sources, the Knicks might need to move on. This entry was posted in Articles and tagged carmelo, Carmelo Anthony, carmelo leaving knicks, KNICKS, knicks keep melo, KNICKS MEMES, Knicks news, knicks rumors, melo, melo leaving knicks, tommy rothman knicks, where will melo sign, will melo stay on June 14, 2014 by Tommy Rothman. I think it’s time for him to go. We could get a couple team players in his absence and restart the rebuilding process we started before Melo and Amare got here. The Knicks are stuck in the bottom tenth of the league. It’ll take a couple of years to climb out and even hint at being a contender.